It took less than five minutes for the Ocelots to pounce onto the scoreboard against visiting Lake Michigan. Despite previous struggles this season, the men’s soccer team had no problem taking a step forward defeating the Red Hawks 3-1 on Sept. 28. With the victory, the Ocelots (4-4, 3-3) showed just how competitive they can be as the team continues to gel with fewer than ten games remaining in the regular season. Overall, the Red Hawks never held possession of the ball for a significant amount of time. “We played good today and got the win we wanted,” said Schoolcraft head coach Rick Larson. Schoolcraft took the lead at 4:41 with a goal by Daniel Ovesea, his first of the season. 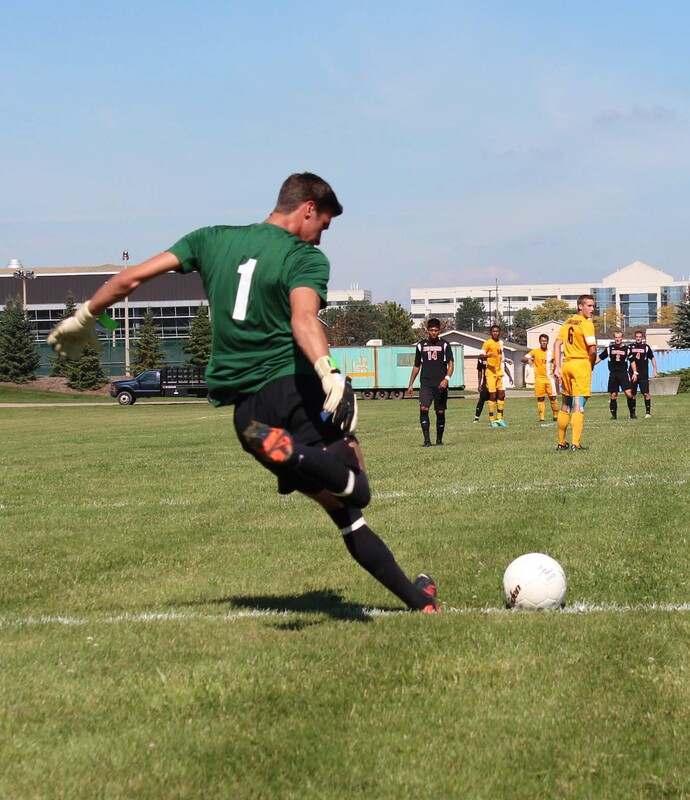 A long ball by goalkeeper Sean Simney was collected by Ovesea who pushed his way past the Lake Michigan defense. The Red Hawks had trouble penetrating a well-organized Schoolcraft midfield and, when they broke through, a solid defense thwarted their effort from all sides of the field. Goalie Sean Simney was solid in net pulling off several brilliant saves, keeping the Red Hawks offense silent. Simney made 12 saves in the victory. The Ocelot’s second goal came when Red Hawks goalkeeper Danny Martinez could not save a tame shot from freshman defender Joshua Hayer, which found its way through his hands and into the net at the 24:23 mark. The team took a commanding lead on their third goal, as forward Nathan Berguson headed in a Derek Boatright corner kick at the 36:04 mark. The team took a comfortable 3-0 lead into the second half. The Red Hawks kept pressuring in the second half. Despite their deficit the pressure finally paid off. Just before the 75th minute, Red Hawks Chase Hullinger broke up the shutout with his first goal of the season at the 74:54 mark. A deep cross from Jose Perez found Hullinger, who headed it into the back of the net past Schoolcraft backup goalie Ryan Tikey. Tikey played the final 12:32 in goal in relief for Simney. In a season of struggles, the Ocelots showed improvements and are starting to build momentum leading into the last half of the regular season. The remaining games prove to be a true test of grit for this team and will challenge the Ocelots ability to work as a team as they push for another post season birth.